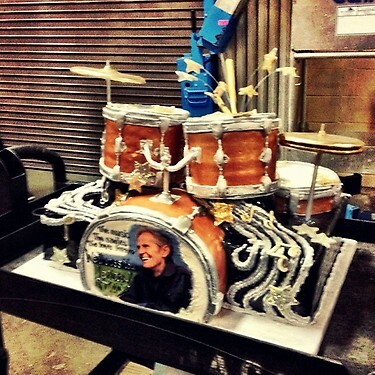 The Love for Levon benefit to save the barn has concluded at the IZOD Center in East Rutherford, NJ. The star-studded cast for this was about as good as it gets, a dream night for all in attendance to celebrate the music, life and continuing legacy of the great Levon Helm. Continue below for the setlist, special guests, live updates (courtesy of Jay Lustig – The Star Ledger) and fan/artist tweets from New Jersey. 1. “The Shape I’m In,” Warren Haynes with house band. 3. “Trouble in Mind,” Jorma Kaukonen. (Helm played drums on Kaukonen’s version of this on Kaukonen’s 2009 River of Time album. New Jersey’s own Barry Mitterhoff plays mandolin with Kaukonen tonight. A few other musicians also play on this but not the full band. 6. “Listening to Levon,” Marc Cohn. A tribute song written by Cohn in 2007. 8. “Life is a Carnival,” Allen Toussaint sings and plays keyboards. Toussaint arranged horns for the Band’s Cahoots album as well as the Rock of Ages and Last Waltz concerts. 9. When I Paint My Masterpiece,” Garth Hudson also playing accordion on this one. Hudson of course was a co-founder of The Band along with Helm. Big ovation for Hudson. Feel-good moment of night so far. John Prine on lead vocals. 10. “Anna Lee,” Bruce Hornsby, very stripped-down acoustic version. Hornsby playing some kind of string instrument, I’m not sure what it is, with Campbell on violin and Amy Helm and Teresa Williams on backing vocals. 11. Full band back, with Rami Jaffee of The Wallflowers on keyboards. Jakob Dylan sings “Ain’t Got No Home,” the oldie from The Band’s Moondog Matinee album. Upbeat, swinging version. Very nice. 12. “Whispering Pines” w/ Lucinda Williams “God bless Levon Helm, his spirit lives on,” she says at the end. Garth Hudson does wild organ improvisation for a couple of minutes as intro to song. 22. “Up on Cripple Creek,” Joe Walsh on guitar and vocals, Robert Randolph on pedal steel. “Jersey boys are here,” says Walsh. *House Band: Larry Campbell on guitar, Don Was on bass, Kenny Aronoff on drums, Amy Helm and Teresa Williams on backing vocals and 5-piece horn section. Huge thanks to Jay Lustig of The Star-Ledger for his constant updates from East Rutherford. 7:34 pm: Am here in arena, waiting for show to start at 8 p.m. Seats are starting to fill up. They’ve curtained off six of the upper-tier sections (239 to 241 and 204 to 206), but otherwise it looks like it’s going to be pretty full. Just a guess but maybe attendance will be somewhere in the area of 15,000. 7:53 pm: Looks like Warren Haynes will be the first act. 8:22 pm: Haynes introduces Gregg Allman. Allman looks thin and fit. Straps on an acoustic guitar. 8:35 pm: Larry Campbell says the Levon Helm Band is now known as the Midnight Ramble Band. 8:44 pm: (via @NoExpiration) Amy Helm puts on a mandolin (her dad’s?) @ #loveforlevon. This has to be difficult. But wow what a voice. 8:56 pm: (Talking about “Move Along Train”) Slow and soulful. Raw, growling guitar solo by Weider. Amy Helm and Williams on backing vocals. 8:57 pm: Allen Toussaint and Jaimoe from The Allman Brothers Band take stage. 9:03 pm: John Prine introduced by Campbell as “a hero of Levon’s” as well as “an old friend of Levon’s”. 11:33 pm : Well, there weren’t any huge unexpected guests, but this show was still quite memorable. Many, many great moments. I really hope they release it as a live CD and/or DVD. Thanks everyone for reading! delighted to be a part of this evenings "love for Levon" concert in NJ-to pay tribute to the MAN-Levon Helm. Amy Helm puts on a mandolin (her dad's?) @ #loveforlevon . This has to be difficult. But wow what a voice. Marc Cohn singing his #LoveforLevon song, Listening to Levon. A true story! @MarcCohn !